Internet of Things is promoting all the possible smart devices to be connected to a global network where each device will be able to render services from other connected devices. This communication is analogous to the social communication of human being which is now represented by online social networks. Social Internet of Things (SIoT) is addressing this new paradigm of machine-to-machine social networks. As a key member of Smart Cities, vehicles are seeing growing interests from research community in the aspect of Internet of Vehicles. 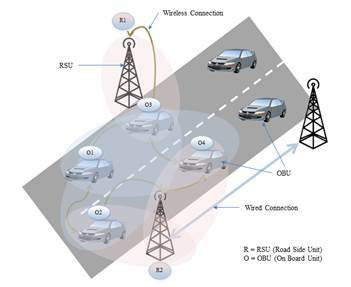 In our research, we proposed a Social Internet of Vehicles (SIoV) system which is an instance of the SIoT specifically targeting the vehicular domain. SIoV system uses the popular system components described in the Vehicular Ad-hoc Networks (VANETs) and realign them according to the proposals made in the IoT-Architecture Reference Model to better place IoV with other IoT domains for easier integration and higher portability. 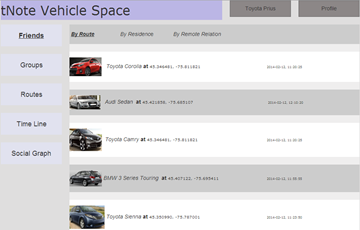 We also identified the social interactions and structures of vehicle-to-vehicle socialization and added additional system components to better manage the generated data. 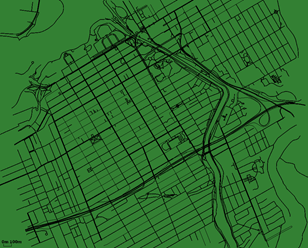 SIoV interaction generates distributed data at various levels of vehicle-to-vehicle, vehicle-to-infrastructure, vehicle-to-home communications and transfer all the data from infrastructure-to-cloud. Different groups of users ranging from driver to transport authority can use different levels of these data from real time to data mining applications. 1. Kazi Masudul Alam, Mukesh Saini, and Abdulmotaleb El Saddik. “Workload model based dynamic adaptation of social internet of vehicles.” Sensors 15.9 (2015): 23262-23285. 2. Kazi Masudul Alam, Mukesh Saini, and Abdulmotaleb El Saddik. 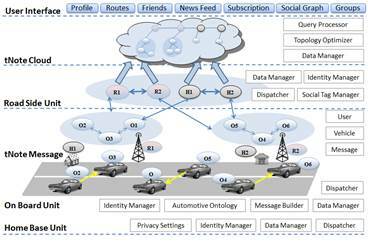 “Toward social internet of vehicles: Concept, architecture, and applications.” IEEE Access 3 (2015): 343-357. 3. Mukesh Saini, Kazi Masudul Alam, Haolin Guo, Abdulhameed Alelaiwi, and Abdulmotaleb El Saddik. “InCloud: a cloud-based middleware for vehicular infotainment systems.” Multimedia Tools and Applications (2016): 1-29. 2. Kazi Masudul Alam, Alex Sopena, and Abdulmotaleb El Saddik. “Design and Development of a Cloud based Cyber-Physical Architecture for the Internet-of-Things.” 2015 IEEE International Symposium on Multimedia (ISM). IEEE, 2015. 3. Kazi Masudul Alam, Mukesh Saini, Dewan T. Ahmed, and Abdulmotaleb El Saddik. “VeDi: A vehicular crowd-sourced video social network for VANETs.” In Local Computer Networks Workshops (LCN Workshops), 2014 IEEE 39th Conference on, pp. 738-745. IEEE, 2014. 4. Kazi Masudul Alam, Mukesh Saini, and Abdulmotaleb El Saddik. “tnote: A social network of vehicles under internet of things.” In International Conference on Internet of Vehicles, pp. 227-236. Springer International Publishing, 2014.